James Cooper is tackled when in possession. Photo by Colin Baker. Matlock are one victory away from the league title after winning their crucial clash with second-placed Coalville 27-25 on Saturday. The winners of this fixture would likely remain top of the league with guaranteed promotion to Midlands One East whilst the losers would be left facing a play-off game against the Midlands Two East South runners-up for the third promotion place. Both sides desperately needed to win. 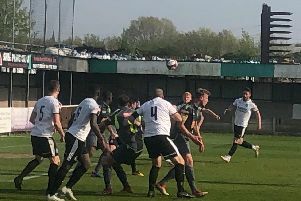 In the early exchanges, Coalville showed poor discipline around the breakdown and also crept offside regularly, the hosts eventually taking the lead when a training ground move saw a peel round the front culminating in Lewis Richardson going over in the corner, the conversion falling short. From the re-start Matlock failed to control the ball and Coalville took advantage of some poor fringe defence to manufacture a good score in the corner, the conversion well struck to put them 7-5 up with only seven minutes gone. From this point the game became something of a battle of attrition in the middle third of the pitch with neither side able to exert any real authority. That was until 30 minutes when Coalville extended their lead to 12-5 with an unconverted try in the corner after some rather inept defending. Matlock were straight back on the attack. A ruck on the Coalville ten metre line saw Matlock break blind and James Cooper burst through two defenders before passing to Jack Wagg who raced under the posts. The conversion was added and score was 12-12. The second-half was just ten minutes old when Coalville, who had begun it well, worked space for a good score in the corner and the conversion bounced back off the post. No-one knew how crucial that would prove to be, although five minutes later Coalville’s lead was extended to 12-20 through a penalty when Matlock were penalised for not rolling away. Matlock then began to show the character and resolve which has seen them earn a few wins this season when the odds seemed to be stacked against them. After the Coalville fly-half was yellow-carded for constantly being offside, Matlock soon got their next try as a variation on the line-out peel saw Richardson go over for his second. The conversion was wide. Matlock grew in confidence to then conjure up a great score as Dave Hartley, Nick Coombes and Ben Neville combined to set up James Fairclough who weaved his way over for the try. George Whittaker’s conversion was sweetly struck and Matlock were 24-20 ahead with eight minutes remaining. Coalville though would not surrender and with Wagg in the sin bin Matlock conceded a try in the corner to go 25-24 down, but again the conversion was crucially unsuccessful. The drama wasn’t over, as Matlock were awarded a penalty 35 yards out after a Coalville player illegally held on to Luke Crofts and Whittaker stepped up to put the crucial kick between the posts to the relief of home players and supporters, the 27-25 win soon confirmed by the final whistle. In order to achieve automatic promotion Matlock must now win their last match away to Dronfield on April 11.